Until recently, the conference room was typically a meeting space with a whiteboard and maybe a speakerphone and a projector/display. Today, technology is changing the collaborative potential of group meeting spaces. Nowhere is this more evident than in small and medium conference rooms. As with any disruptive change, however welcome, challenges abound. Amid a dazzling range... of video clients (think WebEx*, Microsoft Lync*, Skype*, Google Hangouts*, Cisco Jabber*, Vidyo*, GoToMeeting*, etc.) and BYOD hardware, IT is increasingly tasked to provide a standard, cost-effective toolset to support the collaborative and creative potential of the enterprise. For most companies, small and medium conference rooms are now the fastest growing collaboration spaces. According to Wainhouse Research, the number of small and medium conference rooms will increase at a much faster pace (48%, 41%) than large rooms (27%). 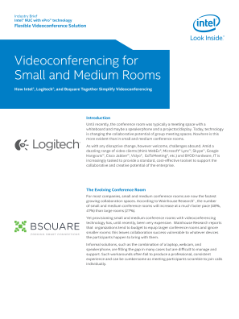 Yet provisioning small and medium conference rooms with videoconferencing technology has, until recently, been very expensive. Wainhouse Research reports that organizations tend to budget to equip larger conference rooms and ignore smaller rooms: this leaves collaboration success vulnerable to whatever devices the participants happen to bring with them. Informal solutions, such as the combination of a laptop, webcam, and speakerphone, are filling the gap in many cases but are difficult to manage and support. Such workarounds often fail to produce a professional, consistent experience and can be cumbersome as meeting participants scramble to join calls individually.